Every one of us is familiar with fidget spinners. They can be quite addictive and fun, offering us to relive from stress and anxiety with each spin. What if now you can get the fidget spinner for endless fun whenever you want directly from your phone? There are apps that offer glorious simulation of this entertaining game, giving you the feeling of a real fidget spinner. We searched and we have the best fidget spinning game for you. Let’s see what the game offers you. Fidget spinning games are very popular among all generations and certainly fun way to relax and take the stress away from the mind. This Fidget Spinner Deluxe game is offering players very entertaining and addictive fidget spinner toy simulation game for endless fun and relaxation of spinning colorful and cool fidget toys. Developed on android platform, easy to play and suitable for any age, the game offers the feeling of the real fidget spinning with the amazing graphics and colorful design with the coolest fidget spinners available. Just swipe, spin and enjoy the game! Why do we choose this spinner game? The Fidget Spinner Deluxe offers its players all necessary qualities and features that give them the realistic feeling of spinning fidgets in real time. Having fun spinning and playing this game, allows players to relax their mind, taking the stress away with each spin of the toy. The game has the simulation movements of the real fidgets, offering colorful visuals on the screen of the phone while letting the players to have limitless fun with simple but addictive gameplay. 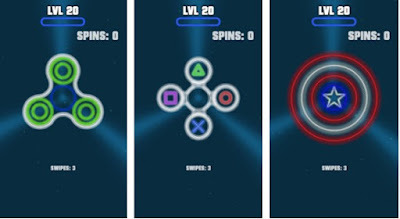 On this game, players only need to swipe with their finger on the screen left or right and see how many times they will be able to spin the fidget toy. The game offers players to play anytime they want and how much they want, playing for fun or even spinning with their friends. Players that swipe the hardest will be able to get a great amount of spins! Different colorful fidget spinner toys are offers and players get to choose any toy they want for spinning. With variety of fidgets available, players can unlock each one of them, constantly spinning and relaxing. Download this game on Google Play for free and relieve from stress and anxiety!